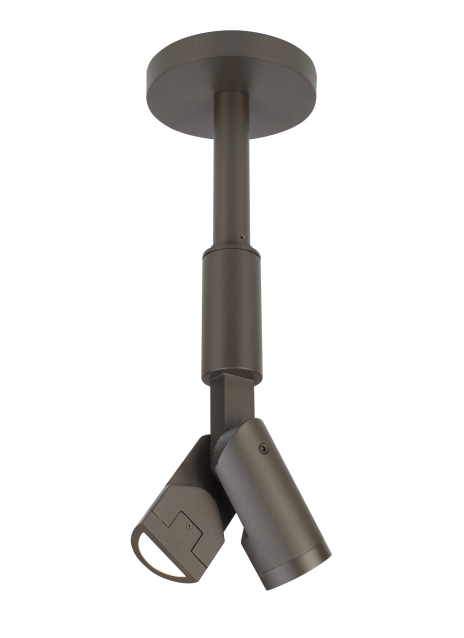 The wall or ceiling mounted Mode Split Outdoor LED flood/accent light from Tech Lighting features a minimalist tubular profile with a unique “split” design that features 2 semi-circular arms that can be aimed together or independently ideal for accent lighting, wall grazing, or ambient exterior illumination. Featuring lockable 185° tilt adjustment and 359° rotation for maximum aiming flexibility with angle markings to ensure precise and consistent aiming, Mode Split allows same-plane illumination when either ceiling or wall mounted. Each LED light source delivers 774 lumens/8.6 watts with 20°, 30°, 40° or 60° optics options. Mode Split features a durable, marine grade powder coat finish available in either Charcoal or Bronze. This exterior light fixture also features stainless steel hardware and impact-resistant, UV stabilized acrylic lensing for added durability and stability.